This apartment can comfortably sleep up to eight (more if required). We are flexible and would like to hear your requirements. You will love the apartment because it is large and gets the afternoon sun through the many windows. Feel like cooking a meal - there is a full kitchen and dining table. The apartment is 2x larger than the average apartment in Wellington. This makes it great for friends, families, and business travellers looking to relax and unwind, and spread their gear out. The bedrooms are separated by the lounge/dining and kitchen areas. The lounge seats ten adults. The dining table sits 6. The entertainment unit and tv have hdmi inputs, and an apple iPhone charger built in. We hope you enjoy the complimentary Netflix, and Freeview digital TV. You will enjoy this with surround sound through the blu-ray DVD player. You are on the doorstep of restaurants and nightlife, shopping, the waterfront, public transport, museums, convention centre, exhibition centre, and numerous other highlights. If you are arriving by car, you are welcome to hire the car park during your stay. It is covered/secure. Please check its availability first. Continental breakfast is provided and all linen is provided free of charge. 3. What time will you depart and by what means? Please ask, not included in price. Fee applies. Subject to availability. 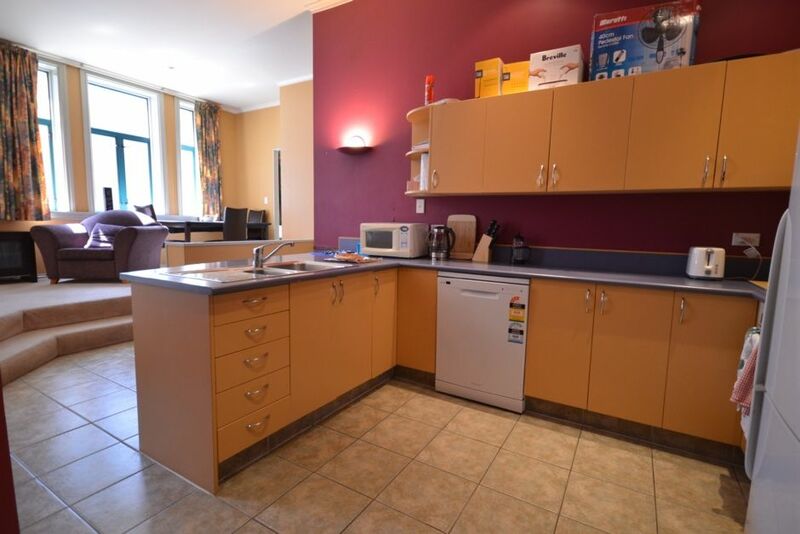 Full kitchen including dishwasher, and microwave, fridge/freezer, sink, stove top and oven. Cleaning of apartment after the stay is included in the cost. Great host, apartment needs some work. The owner’s dad met us to give us the keys and show us how to get i to the apartment. He is a wonderful man and made our first hour in Wellington welcoming. The apartment is conveniently located for walking to museums, restaurants, churches and the whole CBD. Food in the fridge was a nice touch. The apartment itself needs some work. Carpets need replacing, furniture needs an update and the whole place would benefit from a thorough cleaning. Nice touch was fruit, milk, and bread and juice. Location is excellent. Paul was very helpful showing us around. Even offered ear plugs due to the party atmosphere outside. Furniture is very tired. Carpet is dirty and needs replacing. Single beds extremely uncomfortable. Overall the entire place needs remodeling. Our wives wouldn’t walk around without slippers because the carpet was so dirty and worn. What a wonderful central location. A great place to base oneself from to take full advantage of Wellington. Easy walk to Westpac Stadium, to the War Memorial. Wonderful cafes, restaurants and great supermarket on the doorstep. Clean and comfortable. Location is convenient for families with many restaurants nearby, supermarket within walking distance and plenty of parking near apartment.